You. Me. 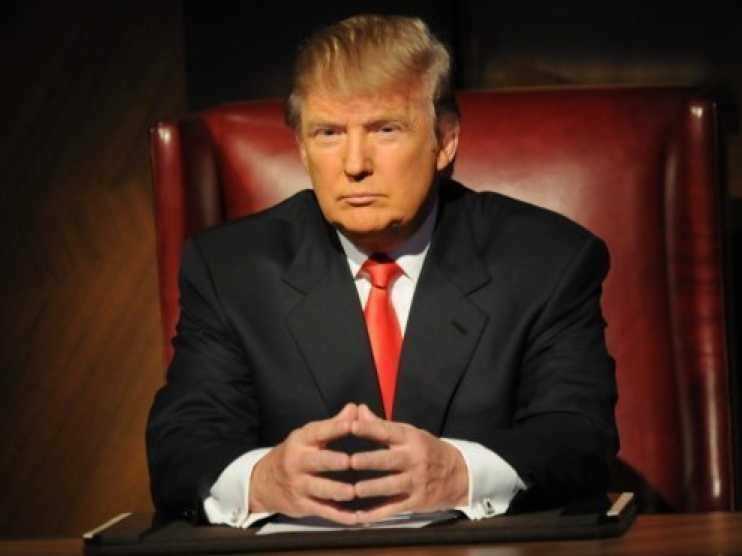 Ride This Crazy Train - Adventures and Observations on The GO: What would the Donald Say? I had just settled in for lunch at my desk — nothing special, just a sandwich — and was catching up on TCT articles, when the story, A human tragedy, scrolled into view. 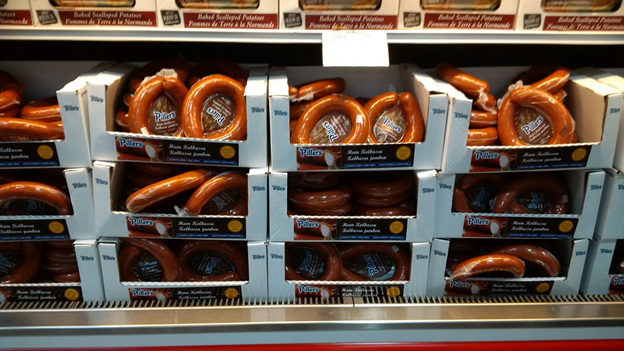 That triggered a bit of a panic attack, because I was supposed to pick up some kielbasa from Costco the prior evening, but I’d forgotten. I donned my coat, grabbed my keys, and raced out the door to my car. I anticipated this wouldn’t take long at all, since Costco was only ten minutes away. As I headed north on Lake St. and approached Dunlop Dr., I saw a GO Transit double decker bus with its hazard flashers on and parked on the ramp for the Niagara Falls bound QEW. I continued along Lake St., over the QEW, onto YMCA Dr., and into the Costco parking lot from where I could see the ‘decker across the highway. I wondered what was amiss, but I didn’t have time for that. My mission was kielbasa, so I raced inside to the grocery section. I picked up a few choice coils, paid for them, and exited the store. Outside, I gazed across the parking lot and the QEW — the DD was still there. I pulled out my cell phone and checked my email, but there was no GO Transit alert about a service disruption. I navigated to gotransit.com, which told me there were no interruptions to bus service. Well, something was up, so I fire off a tweet to @GOtransit, which went unanswered. I checked the time and realized the next Burlington bound bus would have just left The Falls. Surely that driver would provide the answer to why their colleague was stranded on the other side of the highway. With twenty minutes to kill, I zipped into Walmart for some light bulbs, exercised my scripted lines for declining their credit card again, and popped out to the bus stop with minutes to spare. I needn’t have rushed. The bus was a no-show. With Mickey’s hands approaching one o’clock, I headed back to the office, where I sent another query to @GOtransit. Readers should note that tweet was answered some 50 minutes later and essentially parroted what I had told them more than 90 minutes before in my first tweet. 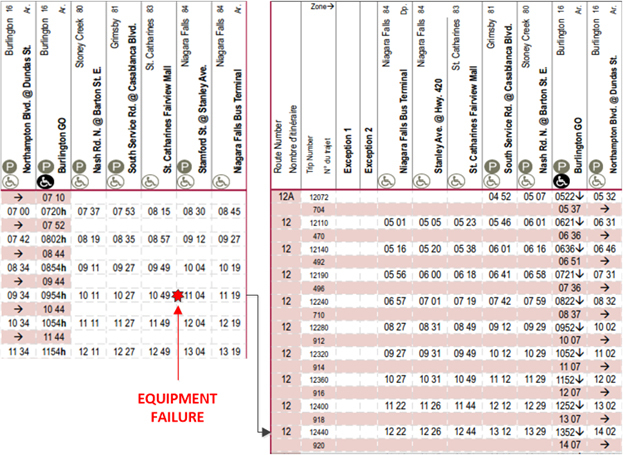 Let’s view this from another perspective, namely, the timeline given by the bus schedule. The ill-fated bus started its trip at 09:34 at the Burlington carpool lot. It was scheduled to arrive in Niagara Falls at 11:19, have a one hour layover, and then head back to Burlington at 12:22. The double-decker croaked after dropping off passengers in St. Catharines. So, by 11:00, Operations and Hamilton supervisors knew there was a problem they had to handle. Why wasn’t a report driver dispatched from Hamilton to at least switch off buses? Presumably, the remaining Niagara bound passengers on the dead ‘decker were picked up by the next bus an hour later. Were these folks compensated for their wasted time and the inconvenience? How long did the driver have to sit on the side of the QEW waiting to be rescued? You can also follow a link to “See how we’re doing”. Let me tell you how you did — EPIC FAIL. The time from equipment failure until passengers were informed of a problem was almost three hours! What were Operations and Twitter Desk staff doing during this time? Celebrating their salary increases from the 5% fare increase we’re being slapped with? “Sorry for the late response …”. What kind of a reply is that? Who is responsible for these repeated failures on Route 12? In August 2015, Matt Baynie, VP Operations, committed to improving bus service in Niagara region. Today’s fiasco is another example of promises made and promises broken. When will it stop? 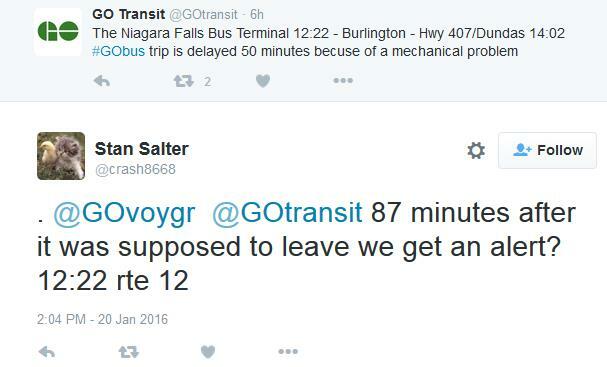 BTW, GO Transit’s real-time bus information service is officially two years behind schedule.